For my second grader's Famous American project she had to select three options off of a project tic-tac-toe sheet. 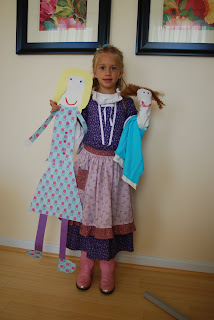 She chose: make a puppet, make the person out of whatever craft supplies and dress up like the person. Everything is due tomorrow so she had to make all her final touches on everything today. I'd say she did quite well all on her own. I didn't have to help her with very much. 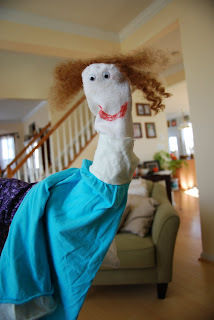 She had trouble getting the hair on her sock puppet to stay put so I showed her that by stuffing a plastic bag in the end of the sock it provides a nice little surface to glue and draw on. After the face was complete I did have to help. I decided to stitch the puppet's dress to the sock. The glue just was not going to endure her exceptionally excitable puppet play. She made the dress by cutting up an old stained dress of hers. I thought it was very clever and made for a very put together little puppet. She has plans on improving it, she loves the sock puppets. We'll see how the alterations go. First it needs to get to school and be presented. 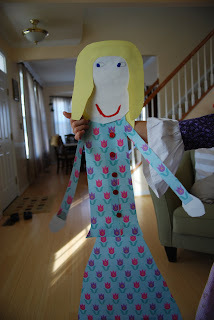 The paper person she created was something that I encouraged her to do. She had wanted to make an enormous statue of Helen Keller but didn't have any idea how to create it as she imagined. There might have been mention of clay and plastic bottles. Anyhow, 2 days is not enough time for that sort of involved craft. She tends to take her time when creating, mostly due to her own creative dilemmas. You just can't force creativity nor sway her too much. I mentioned the paper person since she had made several of us, and her friends, even of Halloween ghouls, and she LOVES to make them. It's clever and perfectly and wholly her creation. I love how it ended up being her interpretation of Helen Keller, although I should mention that she made her blond because we didn't have any more brown paper (for shame!) in the house. I'd like to say that we hardly have any craft paper left in the house because they have used it all. And believe me when I say this, we had LOTS of paper, so much so that I was wondering if we'd ever use it all before they got out of grade school. Turns out, yes, yes they can go through 1000s of sheets of construction paper. As for dressing up like Helen Keller that was the easiest part. Dress-up is an established aspect of life in this house. If you don't play dress-up then what else could you do for fun? The dress is one we purchased while at Monticello. There was a dress shop that sold all kinds of beautiful dresses, some made for play and others for the real deal of period plays or historical education. I was in love with those dresses, such amazing beautiful dresses. Of course the girls fell in love with them but they were $100s of dollars each and that's just not what I would buy for my girls to play in. Amazingly we found that purple dress she's wearing for $40.00! It was a mistake dress, a small bodice sewn to a long skirt. Being that Olivia (and Leah) are skinny little things the dress fit her perfectly. The shop worker said the dress has been there about a year and not one girl fit it, and many tried. So it was kind of like a Cinderella type thing but with a dress. I think I've gotten off track here, I think my point was that the dress is not 19th century but it'll do. Olivia chose the purple dress and found an apron that Grandma made and pulled back her hair found a bow and called it done. No, Helen Keller was not fond of wearing pink cowgirl boots but you must remember this is Olivia here and this is her Helen Keller. Overall I think she did quite well and I can't wait to hear about how her presentation went and all the other exciting stories she'll be happy to tell me.